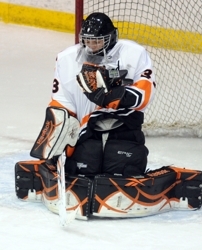 Michael Bitzer has been an anchor in nets for the Spuds this winter (Photo by Tim Kolehmainen). As a former goaltender, Moorhead coach Dave Morinville sees the ice from the net outward. It's no surprise his team plays much the same way. 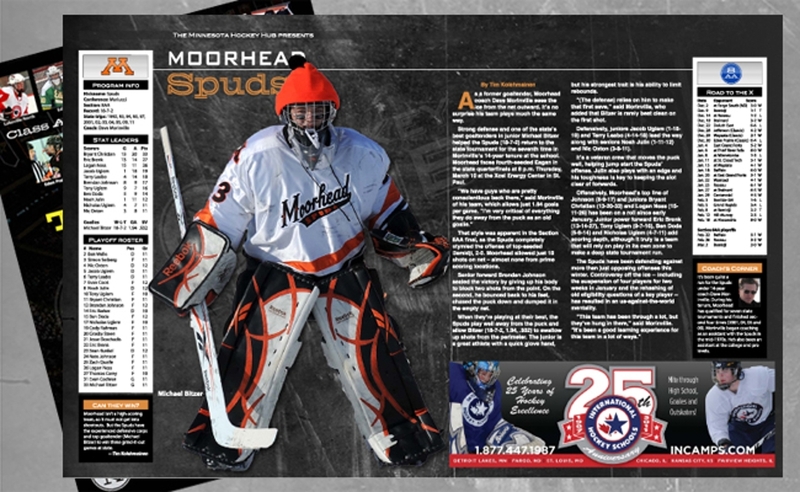 Strong defense and one of the state's best goaltenders in junior Michael Bitzer helped the Spuds (18-7-2) return to the state tournament for the seventh time in Morinville's 14-year tenure at the school. Moorhead faces fourth-seeded Eagan in the state quarterfinals at 8 p.m. Thursday, March 10 at the Xcel Energy Center in St. Paul. That style was apparent in the Section 8AA final, as the Spuds completely stymied the offense of top-seeded Bemidji, 2-0. Moorhead allowed just 18 shots on net -- almost none from prime scoring locations. Senior forward Brendan Johnson sealed the victory by giving up his body to block two shots from the point. On the second, he bounced back to his feet, chased the puck down and dumped it in the empty net. When they're playing at their best, the Spuds play well away from the puck and allow Bitzer (18-7-2, 1.94, .932) to swallow up shots from the perimeter. The junior is a great athlete with a quick glove hand, but his strongest trait is his ability to limit rebounds. “(The defense) relies on him to make that first save,” said Morinville, who added that Bitzer is rarely beat clean on the first shot. Defensively, juniors Jacob Uglem (1-18-19) and Terry Leabo (4-14-18) lead the way along with seniors Noah Julin (1-11-12) and Nic Oxton (3-8-11). It's a veteran crew that moves the puck well, helping jump start the Spuds' offense. Julin also plays with an edge and his toughness is key to keeping the slot clear of forwards. Offensively, Moorhead's top line of Johnson (8-9-17) and juniors Bryant Christian (13-20-33) and Logan Ness (15-11-26) has been on a roll since early January. Junior power forward Eric Brenk (13-14-27), Tony Uglem (9-7-16), Ben Doda (5-9-14) and Nicholas Uglem (4-7-11) add scoring depth, although it truly is a team that will rely on play in its own zone to make a deep state tournament run. The Spuds have been defending against more than just opposing offenses this winter. Controversy off the ice -- including the suspension of four players for two weeks in January and the rehashing of old eligibility questions of a key player -- has resulted in an us-against-the-world mentality. Moorhead isn’t a high-scoring team, so it must not get into shootouts. But the Spuds have the experienced defensive corps and top goaltender (Michael Bitzer) to win three grind-it-out games at state. It’s been quite a run for the Spuds under 14-year coach Dave Morinville. 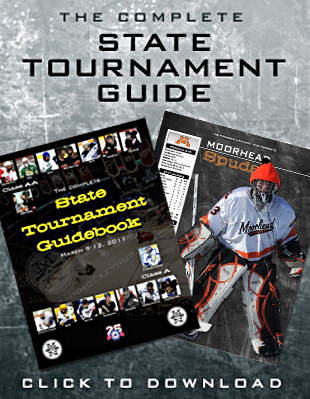 During his tenure, Moorhead has qualified for seven state tournaments and finished second four times (2001, 04, 05 and 09). Morinville began coaching as an assistant with the Spuds in the mid-1970s and also at the college and pro levels.